He believed the dog was immortal. 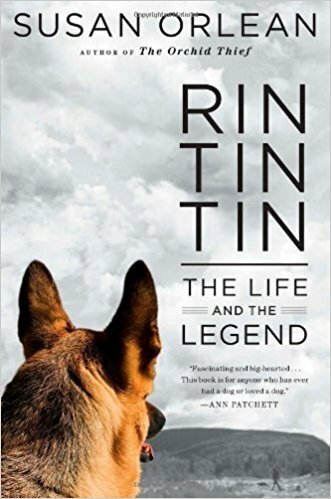 So begins Susan Orlean’s sweeping, powerfully moving account of Rin Tin Tin’s journey from abandoned puppy to movie star and international icon. Spanning almost one hundred years of history, from the dog’s improbable discovery on a battlefield in 1918 to his tumultuous rise through Hollywood and beyond, Rin Tin Tin is a love story about “the mutual devotion between one man and one dog” (The Wall Street Journal) that is also a quintessentially American story of reinvention, a captivating exploration of our spiritual bond with animals, and a stirring meditation on mortality and immortality. I really enjoyed Rin Tin Tin. I have watched a few Rin Tin Tin episodes with my grandpa, so this was special for me because I have those memories of seeing Rin Tin Tin on the screen over fifty years after they were film. I learned a lot about the history of not only this dog, but other movie dogs like Lassie, who I also enjoyed watching on TV when I was younger. I also liked learning more about the movie and TV show business, especially, the parts where it talked about silent pictures and animals importance in them. This is a great read for animal lovers and those who enjoy learning about different parts of history and film.